While United miles might not be the most valuable awards currency out there, there’s still a lot to like about the UnitedSM Explorer Card for anyone that flies the airline with any regularity. With the United Explorer card, you’ll earn two United miles per dollar on restaurant purchases, hotel accommodations (when booked directly through the hotel), and of course, United Airlines purchases, including everything from tickets to fees to onboard snacks and Wi-Fi. With most one-way domestic tickets starting at 12,500 points each way (if you’re lucky enough to find a saver fare), United miles are far from the most valuable domestic airline currency. But you can use your miles to book flights on dozens of Star Alliance and partner airlines around the world, which is where you’ll generally find the sweet spots. That’s not to say United miles aren’t useful—I recentlybooked a $300 United flight for 12,500 points, a terrific 2.4 cent per mile valuation—it just requires a little more work and flexibility to maximize them. The Points Guy’s current 1.4 cent valuation seems fair for United miles, considering the the ability to use them on partner airlines. 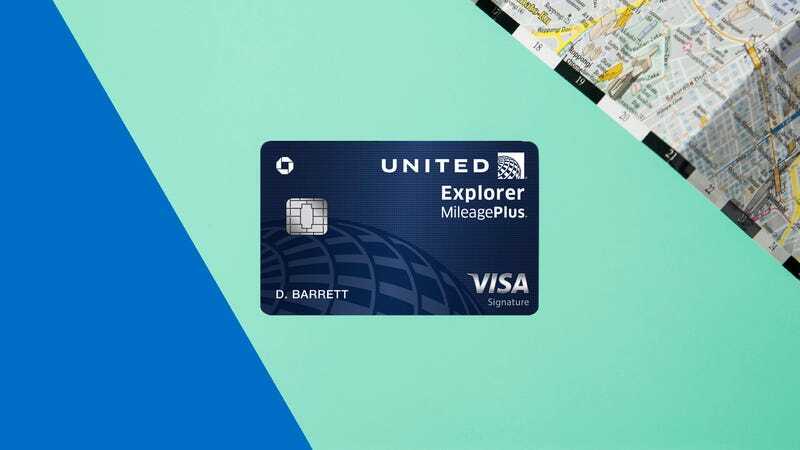 Roughly in line with other domestic airline credit cards, the United Explorer Card carries a $95 annual fee, though it is waived in your first year. Chase recently improved the Explorer Card’s welcome bonus, and now will give you 40,000 miles after spending $2,000 in the first two months (not three, like most cards), and then an additional 20,000 miles after spending $8,000 total in your first six months. That’s a pretty heavy lift for those 20,000 bonus miles, but it still works out to a more than three miles per dollar bonus, in addition to whatever miles you’d normally earn for the purchases that got you there. The miles are great, but perks are the real reason to get this card. Of course, you get priority boarding, a free checked bag on United flights when booked with the card, and no foreign transaction fees; nice, but pretty standard at this point. But you’ll also get a 25% credit back on your account on all in-flight purchases, two one-time United Club lounge passes per year (worth over $100 in cash, plus a whole lot more in sanity during a long layover or delay), and even up to $100 towards Global Entry or TSA Precheck every four years. Just pay your processing fee with card, and the charge will be erased. We’ve seen that benefit on other travel rewards cards like the Chase Sapphire Reserve, but rarely on cards with annual fees this low (let alone waived in the first year). If you fly United more than a couple of times per year, this card seems like an obvious addition to your wallet. Between its new and improved welcome offer and generous suite of perks to improve your travel experience, it more than justifies its annual fee.